Seems like Italian car maker, Fiat is set to re-activate its automobile brand in India. Fiat has always brought aspiration models to India. Very recently the Italian car- maker Fiat launched Abarth 595 Competizione which was priced at INR 29.85 lakh. And now it is the time for the launch of Abarth Punto from Fiat – the car is expected to launch on October 19 of 2015, reports suggest. Unlike other models from Fiat, the all new Abarth Punto shall carry a very affordable price tag as it is based on much affordable Fiat Punto which is locally manufactured. The visual difference of the car is going to be its racy colour scheme on Abarth Punto which includes red-and-black combination, and a matt grey body colour that comes with bright orange highlights. Also the major superficial difference would be Abarth badges on the front and back and a set of new 16 inch alloy wheels that comes with diamond-cut finish. At the rear end of the car, one could spot a subtle spoiler and chrome exhaust trims. Talking about the interiors of the car, the all new Fiat Abarth Punto shall get a sporty all-black interior, where as the black seat upholstery comes with subtle yellow and the red stitching combination. Prominently, the all new Fiat Abarth Punto Evo is going to be equipped with turbo-charged 1.4 litre, 4-cylinder, twin-cam engine that can churn out a maximum power of 145PS and 212Nm of peak torque. This is going to make this car one of the most powerful hatchbacks produced in India. 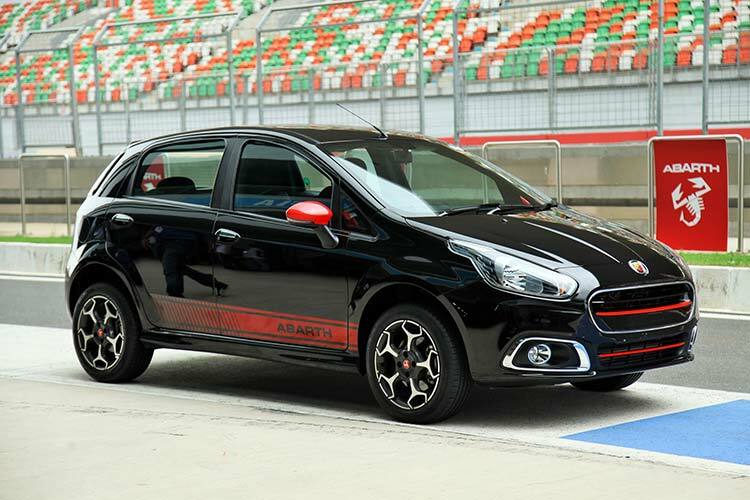 This new hot hatchback, Abarth Punto, will be priced close to the range of INR 10 lakh, when it is launched. Where as, Italian car-maker, Fiat has started accepting bookings of Abarth Punto across its dealership for a sum of INR 50,000.